One of the most horrific things that can happen to anyone in the world just happened to me. Yes, my shower drain got clogged. To make matters worse, there was a pool of discoloured water left in the shower base, and neither a plunger nor a wire hook would clear up the blockage. I tried to brainstorm a few possible causes of this catastrophe, which included a dead rodent in the pipes, a tree branch growing in the wrong place, or perhaps a very plump spider, which would be the most terrifying of nightmares. After nearly spraining my back trying to unclog the drain and almost falling face-first into the crap-infused water, all I fished out were a few stray pieces of hair. I give up. 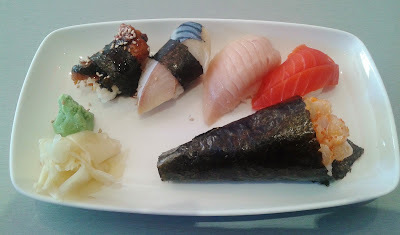 Since I had no way of using the shower, I decided to cleanse myself by going for some sushi instead. Being the classic indecisive me, I had my office mates help me pick out a restaurant. 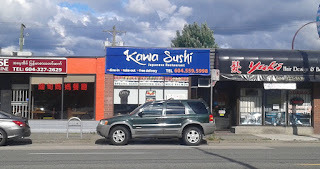 After they had mentioned about 20 different sushi restaurants that I had previously tried and blogged about, one of them came up with Kawa Sushi. I had never heard of this Japanese restaurant before (which is rare for me), so off I went to try it. When I went inside, it smelled as if they had decorated the whole place with Chinatown-flavored air fresheners. Well, pretty much all the neighbouring shops and businesses were Chinese, so maybe that makes it okay? The dining area was nothing fancy, although the menus were clean and nicely designed. The menu featured many low-priced items, and the restaurant got quite busy soon after I had ordered. I ordered this purely for its novelty, but I was a little concerned when it arrived. 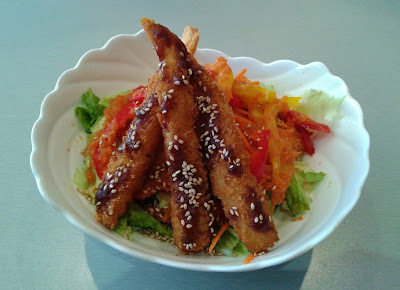 The panko batter felt rather hard, and there was very little shrimp meat inside the shrimp tempura. Moving down the salad, the bell peppers and the zingy carrot-based vinaigrette went together about as well as a toddler and an out-of-tune piano. The vinaigrette was also too acidic for my liking. The only plus to this dish was its generous portion size. 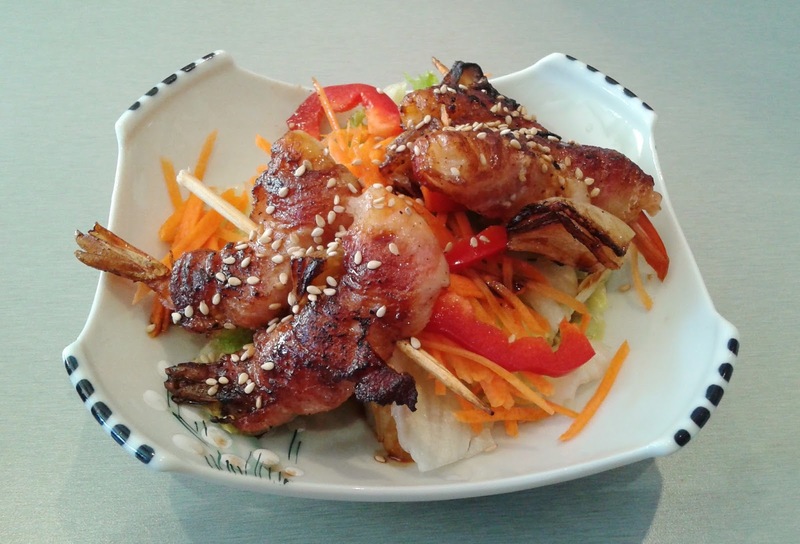 Faring much better was the BBQ Prawn & Bacon, which came with four plump BBQ prawns wrapped with a flavourful layer of bacon. There was sufficient moisture throughout the prawns, and this was undoubtedly my favourite dish during my visit. It would be nice if the tails were fully removed from the prawns. The Kym Roll consisted of asparagus, tuna, avocado, tuna tataki, spicy sauce, onion, and "garlic flashes." There were many special rolls on the menu, but I decided to order this one because the word "flashes" was very intriguing to me. The "garlic flashes" added a nice crunch to the roll, and the amount of spiciness was very right. Unfortunately, the tuna tasted very wrong. The tuna on top was unevenly seared and tasted fishy, while the tuna inside had as much flavour as the plain, watery congee my mom used to make me eat if I consumed too much junk food. The waitress was remarkably hardworking and efficient at providing friendly and attentive service to every patron. I was very impressed. If all women were like that, the world would be a fantastic place. Based on this visit, cooked food seemed to be Kawa Sushi's strength, whereas the freshness for some types of raw fish became problematic. The prices here are some of the most budget-friendly that I have seen in this region, but the quality of the food appears to match those prices. "The waitress was remarkably hardworking and efficient at providing friendly and attentive service to every patron. I was very impressed. If all women were like that, the world would be a fantastic place." And if all men in the world were to help all the hardworking women, the world would be an even more fantastic place, eh ?